Half term is fast approaching and the weeks seem to be flying by. Exams will swiftly follow and so it is an important time for preparation. Mrs de Gruchy held her usual EAL session and Cyrus, Kobe and Bosco went to Truro Badminton Club, which they returned very excited about! Mr Nick supplied chocolate from the ‘goodie bag’ and all was well! Saturday was a day for washing, relaxing, going to town and some table-tennis. It was a lovely evening and so we went off to Porth Beach in Newquay for some 5 a side football and of course, the obligatory visit to KFC on the way home. 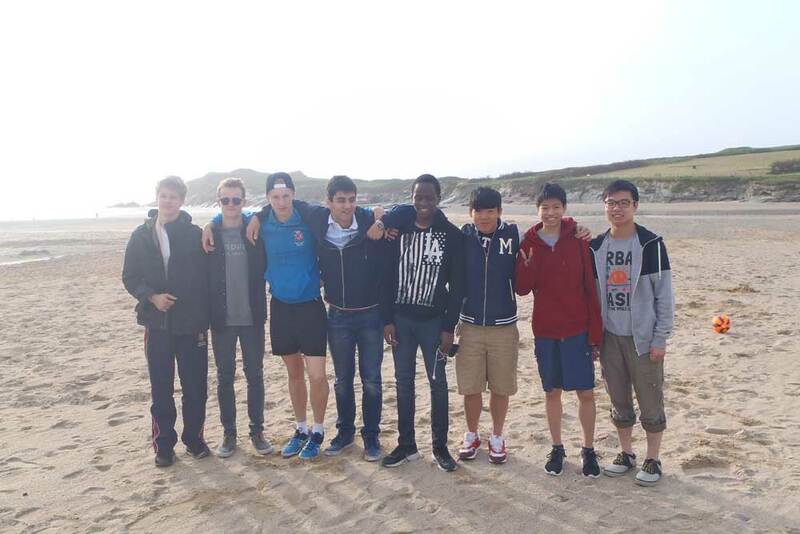 Pentreve boarders on the beach. Having worked up an appetite, despite having only eaten supper at 5.45pm, the boys were ready for some serious chicken – although I think one or two ate too much! We returned around 9pm, just in time for a DVD and time to allow the chicken to be digested! Sunday was a hearty brunch followed by a session on the Flowrider at Retallack. Some are old hats by now and some were new to it. That said, there was some impressive riding and lots of tricks on display and many stood up too. The hot tub is always a welcome place for some respite too!! Sunday night was the chance to catch a breath, do prep and prepare for another week ahead.